Read about our impressions, after scouting out single tracks on the Azores. It all started with planning normal holidays for me and my girlfriend. We wanted to be close to the sea and a destination that is warmer than Germany in April! After finding a cheap flight to the Azores we booked for the Portuguese island of São Miguel in the Atlantic Ocean. After introducing trail-business to Carlos, he offered us his support. We were invited to bike with Carlos for two days on Enduro rental bikes. Awesome! Hence no further planning for us was necessary. The Region of the Azores (Região Autónoma dos Açores) is a volcanic archipelago composed of nine islands. Approximately 1400 km west of Portugal in the Atlantic Ocean the climate is subtropical with only moderate changes in temperature over the year. From September until March you can expect 10 or more raining days on average, this is why we would recommend mountain biking on the Azores from April to August. Insider tip: This period is also the best if you want to go out for whale watching and see the big whales like humpback, sperm whale or even blue whale! 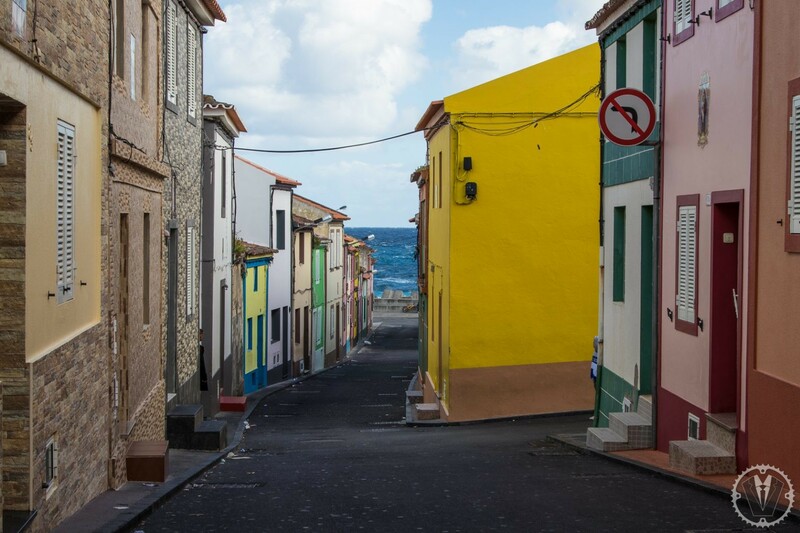 Finding accommodation on São Miguel, the main island of the Azores, is fairly easy. In a way it is up to you and your budget if you prefer to stay in a hotel or a six-bed dorm. A friend from Portuguese told me that many locals own property. Therefore the offers of private guestrooms are enormous. Moreover, the government on the Azores supports the locals to set up private guestrooms. We booked via airbnb and stayed in Rabo de Peixe, a small village approximately 15 minutes drive by car from Ponta Delgada. The place itself turned out to be quite luxurious at a rather moderate price of only 33,- Euros a night. The Azores being a part of Portugal, Portuguese is the language spoken on the archipelago. Nevertheless it seems that almost everybody speaks English. As soon as people realized our Portuguese is not really good (not to say practically non-existent) they immediately switched to English. We’re still going to equip you with some basic sentences in Portuguese on our blog that can be useful for your mountain bike holidays on the Azores. As soon as you set foot on Sao Miguel you’ll realize there’s lots of cattle. A variety of local dairy products is available wherever you go. In addition the cows spend their days hanging around on lush green hillsides. Feeding on nothing but fresh grass, you won’t be surprised that both the cheese and the steak you get are outstanding in taste and quality. Steak is typically served with fries and a fried egg on top. You’ll get great quality at a reasonable price at the Restaurante O Galego in Ponta Delgada. Attention: you need a reservation, because it is very much frequented by locals! Obviously, an island in the Atlantic Ocean is perfect for fresh seafood. So if you are more the fish kind of person you’ll just love the local “Cataplana”. An incredibly tasty hotpot of various fish, shrimp, clams and vegetables. We had an amazing Cataplana at the O Pescador in Rabo de Peixe. Luckily we were invited by our host to try another local speciality. The “Cozido” is a dish cooked by the geothermal heat of the volcanic ground. Pots of variable meats and vegetables are buried in the ground near the hot springs, the “Caldeiras”. It is cooked for several hours, solely by the heat provided in the volcanic soil. Furthermore the Azorean Pineapples make a great dessert. If you feel more like a less healthy option there’s also tons tasty Portuguese pastries. For instance our favorite the famous Pastéis de Nata. The weather on the Azores is unpredictable, so we were lucky to have our local mountain bike guide. Carlos from bikesafaritour.com always had a few options to choose from, depending on the weather at a given time or location. He also told us the most reliable weather forecast for the Azores can be found on windguru. But also that there is no such thing as a reliable forecast for the Azores. We started our first trip, the Indiana Jones trail, at the Lagoa do Fogo in dense fog. The Indiana Jones is a natural trail without any man made obstacles (except electric cow fences). It is pretty challenging to ride and surely something for the advanced biker – especially when it rains. Only 500 meters later Daniel decided to take an unintended and refreshing bath in one of the muddy puddles (with a touch of cow crap). All good things come in threes and off we went into the forest. Followed by his smell – urghs! Anyhow, the almost surreal fauna of giant ferns and intense shades of green gives you the feeling of entering Jurassic Park. Sadly, we could not spot any dinosaurs. Following a narrow and mossy path we passed small bridges, waterfalls, steep cliffs and an ancient lava river. Compared to the first section the terrain became a easier to ride with less slippery and steep sections. Overall the Indiana Jones trail is a very beautiful trail. It is extremely diverse on its 9 km for both landscape and difficulty, but an amazing experience you should not miss biking on the Azores. After the Indiana Jones trail Carlos took us to the Bandeirinha Downhill track. The entry in a curve on the road is marked only by a small sign saying “Trelho Downhill” and as you can tell by the name it is a downhill track. Due to the rain over the last days the trail was very muddy and demanding. Anyways, even Luisa, being the first time on a full suspension bike, made it down. Rich on drops, doubles, root sections and narrow switchbacks you can have a lot of fun on the 2.4 km long Bandeirinha. According to Luisa it is easily possible to go around the obstacles and enjoy the ride. No need to be a downhill pro! On our second day of mountain biking on the Azores we started with a ride through a forest close to Furnas. It is called 16 seconds. According to Carlos the name derives from a challenge of two bike buddies: The first one, a skinny and well-trained guy, the other one a bit more chubby and less trained. They made a bet who manages the trail faster after only one week of training. Long story short, the chubby guy won 16 seconds ahead of the skinny guy. Entering the 16 seconds trail we got a feeling of being part of the movie Jurassic Park again. Still no dinosaurs but dense fern, moss and full of old trees. Short but beautiful is the best description for the 16 seconds. It is probably the best trail for everybody who wants to get into mountain biking on the Azores. If you start here you will love it forever! Our last trail on the Azores before heading back to Germany was a smooth flow trail east of Furnas. About 4.5 km of beautiful trail winding down from 400 m high mountain ridge down to Ribeira Quente at the south coast. Not only is the trail beautiful and easy to ride, it also offers exciting sections. At about half the way we went down a couple of switchback curves with both wooden and slippery stairs, roots and washouts. In the lower part of the trail we crossed an about 1.5 m wide and 10 m long concrete bridge without any side barriers. For accessing the bridge we had to descend about 4 meters on a concrete staircase. Sounds simple but when you sit on your bike in front of the stairs to the bridge your heart will for sure beat a bit faster than your resting pulse. First thing we learned is more a cultural thing: You can get along with English very well on the Azores. Secondly, you can never trust the weather forecast on the Azores. It is not only a saying that you can experience four seasons on one day – we had at least three on every day. As this was our second mountain bike holidays with rental bikes there is another important learning: Take your time for a proper setting on the rental bike. Always check the shocker pressure and don´t forget the rebound setting, like Daniel did on his rental bike. We have to come back! Due to the bad weather we probably biked 2 % percent of what is possible on the Azores. Yes, we got a first impression of the main island São Miguel, but the other islands offer more great mountain bike trails to explore. Moreover, the Azores provide trails for every category of mountain biking. Nevertheless we think the most intense experience is going for All Mountain and Enduro bikes to experience a taste of the Jurassic Park-like single tracks. Furthermore, this is the first time we highly recommend going on the trails with a local guide. Sure you can bike the obvious trails, like the 16 seconds and the Bandeirinha Downhill without a guide. But on the other trails we would have had no chance finding the hidden entrances or junctions, even with a GPS track. In our case we were lucky to get support from Carlos from bikesafaritour.com, who we can highly recommend.